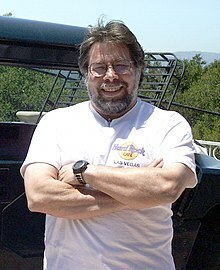 Stephen (or Stephan) Gary "Steve" Wozniak:18 (born August 11, 1950), kent as "Woz", is an American pioneer o the personal computer revolution o the 1970s (alang wi Apple Computer co-foonder, Steve Jobs). ↑ "Stephen Wozniak". biography. biography.com. Retrieved April 6, 2012. This page wis last eeditit on 10 Apryle 2017, at 02:29.